Sarah Hallberg ’94, M.S. ’96, stands against traditional thinking in promoting a diet that cuts carbohydrates and increases fat as a way to eliminate Type 2 diabetes. Hallberg ’94, M.S. ’96, studied exercise science as an undergraduate before completing her master’s in exercise physiology. Both fit her passion for exercise. She worked at BroMenn while earning both degrees. Her next step was completion of one year in cardiac rehab in Chicago. Her plan had been to complete a doctorate in exercise physiology until an argument with a cardiologist at the facility over a patient’s exercise regimen convinced Hallberg to become a doctor herself. The goal was achieved in 2002, as Hallberg graduated from Des Moines University’s College of Osteopathic Medicine. She spent years as an internal medicine physician in a primary care setting before getting board certified in obesity medicine and clinical lipidology. She then founded the obesity program at Indiana University (IU) Health Arnett in Lafayette, Indiana. It was there she found her calling in the battle against Type 2 diabetes. “IU knew that I had this exercise background, and they asked me to start a weight-loss clinic,” said Hallberg, who still serves as medical director of the program that began in 2011. To Hallberg’s surprise, she recognized an “epidemic of Type 2 diabetes” among patients striving to lose weight. Diabetes is a condition where the body’s blood glucose exceeds a normal range, according to the American Diabetic Association (ADA). The most common form is Type 2, which typically develops in adulthood and does not usually require insulin initially. Without intervention, it can worsen to the point the drug is needed. Hallberg said that since diabetes is a problem with elevated blood sugar and carbohydrates are what cause blood sugar to rise, carbs need to be cut, or at least cut down. She notes more physicians are agreeing with the idea of carb restrictions. But she also readily acknowledged that it’s not a meal plan readily embraced among people committed to losing weight, at least not initially. “There’s a lot of misconception out there about what to eat,” Hallberg said. She faults corporations, the government, and the medical community in part for the dilemma—as well as America’s resulting obesity issue and the accompanying rise of Type 2 diabetes. The United States Department of Agriculture, for example, makes dietary and nutritional recommendations that are designed to help Americans learn how to eat a healthy diet. The agency has encouraged consumers to follow the Food Guide Pyramid, which breaks food into six categories. “The food pyramid—plain and simple—is bad advice,” Hallberg said, explaining that it labels fat as a negative while promoting carb consumption. She calls the guidelines “rubbish,” convinced they are not based on appropriate evidence. “The dietary guidelines are sometimes called an evidence-free zone,” she said. “The horrible, unintended consequences gave us the diabetes and obesity epidemic.” Hallberg’s depiction of the problem’s scope is not an exaggeration. The ADA reports that more than 30 million Americans have diabetes, which is slightly more than 9 percent of the population. Of that number, about 1.25 million have Type 1 and must take insulin. There are 1.5 million new diagnoses each year, making it the seventh leading cause of death in the United States. Medical costs and reduced productivity in 2017 in the U.S. reached $327 billion, according to the association. 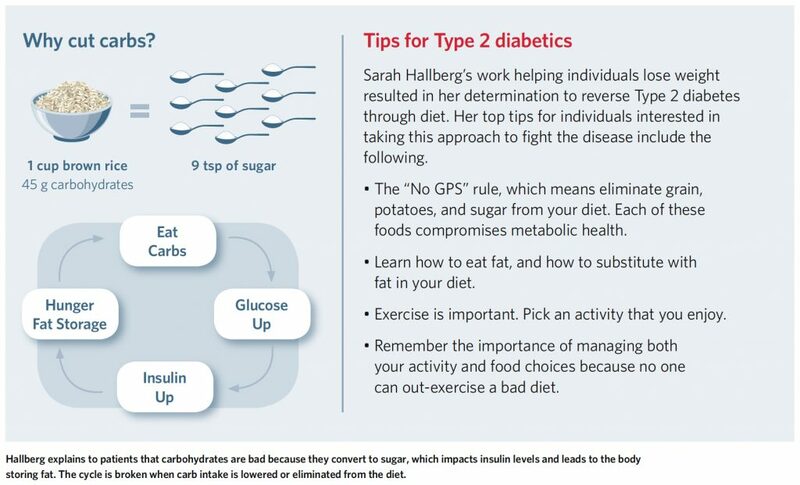 The medical community fights diabetes with prescriptions, which Hallberg calls the “vicious cycle of the insulin merry-go-round.” She advocates attacking carbs instead, and compares ignoring them while opting for insulin as akin to putting a Band-Aid on a bullet hole. “The standard of care is just to give insulin—which is a fat-storage hormone—so you gain weight,” Hallberg said. Her aversion to drug prescriptions fits the treatment offered through Virta Health, where Hallberg is now a medical director. An online medical clinic founded in 2014 in California, Virta’s mission is to reverse 100 million cases of Type 2 diabetes without medication by 2025. To that end, the company has secured $45 million in new funding. Remote offices are located around the country, including near Hallberg’s home in West Lafayette, Indiana. She lives there with her husband, Brad ’95, and their three children. Now 46, Hallberg describes herself in three words: passionate, mother, wife. She advances through Virta her other roles as an educator, physician, and researcher. She became connected with the company via one of its founders. IU and Virta teamed to do a study of diabetes, with Hallberg later joining the company “because they were solving the problem,” she said. “We treat to reverse Type 2 patients, using a technology-enabled, remote-care clinic,” Hallberg said in describing Virta. She remains the medical director at IU, but research in her role at Virta is her primary focus. She’s had a number of papers published in peer-reviewed publications, including The British Journal of Sports Medicine and Diabetes Therapy. Hallberg also shares the results of studies through podcasts. In 2015 she gave a TEDx talk, which can be viewed online. “My research and findings need to be available to millions of people struggling with Type 2 diabetes, and not just to the patients who come to see me in the clinic,” she said. An alumni network dedicated to graduates 55 years and older, Redbird Prime offers several services tailored to individuals in this active stage of life. To learn more about the Redbird Prime Alumni Network, visit Alumni.IllinoisState.edu/Prime. To get involved in the planning of programs and activities for the network, contact Stephanie Duquenne at saduque@IllinoisState.edu or (309) 438-2586.